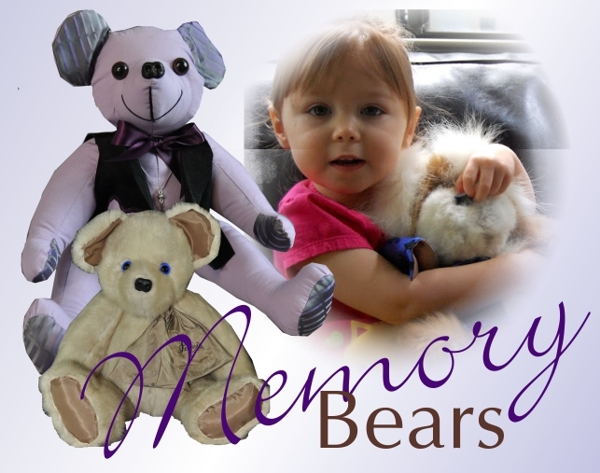 People are often curious about what goes into creating an heirloom bear here at Fairy Godmother Creations. Every bear is different, of course, but we have some processes that we follow to make sure that every bear we create will be a cherished family heirloom for generations to come. At Fairy Godmother Creations, we realize that we’re working with materials that have meaning to the person who sends them. As a result, we treat those materials with respect. Here is a description of our process. When the package of materials arrives, the first thing we do is check the fur (or fabric) to make sure it can handle the sewing process. Although there are techniques we can use to re-enforce the fur, if we simply don’t believe the fur will hold up, I will call and give the option of having us try and stabilize the fur with the understanding stated under my FAQ or re-package the fur and return it to the sender along with their payment minus the cost of shipping. If the fur/fabric is in workable condition, I will send an email letting the person know. If there is a question as to how many bears or what size bears we can get out of the piece, I can usually answer those questions at that time. We then carefully remove all linings and interfaces from the fur garment. We test the lining material to see if it will hold up to being used as accent cloth for paw and ear pads. On really old coats, the lining material gets very fragile so it isn’t always useable. The garment is then disassembled at the primary seams to retrieve as much of the fur as possible and to allow the fur to lay flat. For fabric garments, we disassemble the garments so that the fabric lays flat. Once the fur/fabric is ready, the pattern pieces are carefully laid out. Since we have to avoid certain types of seams and we need certain pieces to match the fur or nap, this can take quite a bit of time. Once every piece for each bear being made is in place, the pieces are cut. The individual parts are machine sewn leaving openings for stuffing each part. The head is sewn, attaching the ears and adding eyes and noses. Once the head looks right, it is attached to the body by hand. Once the arms, legs, paws are sewn, the arms and legs are attached using plastic joints or locking nuts, bolts and washers so that the arms and legs move. For lighter weight fabrics, we may use a corded joint. Once all of the arms and legs are attached and moving correctly, each limb is stuffed and closed with hand stitches. If an outfit or accessories have been ordered, we will create it separately. An outfit can take several hours to make and each is created uniquely for the bear. For those not paying for a full outfit, a scarf or ribbon is added. We take a picture and email it before putting the final bears into the mail. I usually post the picture on the web site with some information about the project. If I receive a comment from the person after they have received their bears, I add it to the picture on my web site. Not everyone takes the time to write but I do like to share the projects. What Kind of Eyes do You Use? I use standard acrylic safety bear eyes for my basic bears. The acrylic eyes are more affordable, long-lasting and look good. They are also more secure so don’t represent a choking hazard for little ones. If someone wants glass eyes, I will use glass eyes. They take a special order and do cost a bit more ($15 per bear) and they ARE NOT for bears being given to little children. Although they are securely applied, glass eyes are attached to a wire that can break if enough twisting and pressure is put on them–making them a potential choking hazard. If someone wants an old fashioned folk-art look, I use buttons for eyes. If you are interested in glass eyes or button eyes, please mention it when you place your order. Do You Create Animals Other Than Bears? Yes, I literally have hundreds of patterns from over 40 years of sewing. If you want a cat, a bunny, a dog or some other animal, let me know what you are looking for. You can click here to see a growing gallery of other animals. How long can I expect to wait before my bear arrives? I tell people that an average bear order takes about five t six weeks from the day I receive the materials to the day I ship it out. Sometimes we will turn an order around faster though. It really depends on how busy we are and our busiest months tend to be April and May, October and November. If timing is important, just send a quick email and I’ll tell you the current turn-around time. I do try to email updates along the way. Starting in mid September, Christmas reservations tend to keep me pretty busy through to Christmas so I highly recommend planning ahead if you are wanting bears as Christmas gifts. Why aren’t your bears’ heads jointed? I try to make bears that can be cuddled and I’m usually working with older materials. In order to joint the head, the bear head and body have to be very firmly stuffed or the head will flop around. This not only makes them less cuddly, it puts extra pressure on the head and body materials. If you want a jointed head, I will do so, but there is a $20 per bear charge. Do you offer internment of ashes? Yes, this is a specialized service and is not offered on my order forms but I can place a small portion of ashes in a sealed water-tight container into each bear. For those who would like to do their own internment, I can create a pocket in the back of each bear that you can slide a small locket or container into. If you want internment options, please call ahead to discuss what will work best for you and your family. How much time do you put into each bear? Normally, each bear takes 8-12 hours depending on the materials and size. There are some preliminary things I have to do to the fur or fabric to make sure it will hold up to the sewing. With some garments it can take nearly an hour just to properly remove the lining. The higher quality the garment, the more difficult to get the lining off. I often have to adapt my patterns to work with the fabric/fur nap as well and this can literally take hours of switching the pattern pieces around when I’m trying to get several bears from a single garment. In addition, the joints take time to apply and have to have the right amount of tension. And, of course, there is a lot of hand sewing involved. How should I send my garment? Pack it into as small a box you can fit it in. I’d prefer not to receive garment bags or cases that need to be returned. If you are concerned about protecting it from moisture, put it into a plastic garbage bag. It will not be in the mail very long–and I remove it from the box when it arrives. How much fur/fabric does it take to make a bear? Each bear has approximately 24 pattern pieces. If someone wants more bears from a garment, I can sometimes adapt my patterns to make smaller bears. I don’t like to work with bears less than 9″ though. Will My Fur Work Well? Mink, Muskrat, Beaver, Squirrel, Weasl, Sable, Ermine, Opposum, Badger and Persian Lamb all make beautiful bears and I can make just about any size bear from these fur types. Rabbit has very thin hide so I have to treat it a bit more and it tends to shed over the years. However, it does make very cute bears in any size (9″-20″). Mouton and Seal These furs have a very thick hide. The final bears are beautiful, but it is nearly impossible to work with bears under 16″ in size. Fox, Silver Fox, coyote and Raccoon all tend to have very thin hide with long pile fur. However, most coats with this fur are made of strips of fur between strips of leather or suede–which gives added strength to the fur. This works well for coats, but when making smaller items–like bears–the strips of leather WILL show. I try to place the pattern pieces so that none of the seams land on leather strips, but this means there is more waste. If you want me to reduce or eliminate the leather strips, I can do so but there is a $75 up-charge to your total order because it is time consuming to do so. I have to cut the strips off and re-bind the fur pieces together. The fur from these animals is so long, the smallest bear size we work with is 16″. Can you use smaller fur pieces? Some people have collars, hats or the kind of decorative stole that is made of several small animals–more like an accent piece than an actual stole. I can make small bears using fur for the head and paws and other fabric for the actual body (which is covered by an outfit). However, I do charge for the bear plus a full outfit to do so. How do I know if my fur will work? Most fur that still has its original lining in good shape tends to be useable. Furriers use lining fabrics that allow the hide to keep its oils. Vintage fur can get dried out over time though–actually, it is the hide that gets dried out. If the hide is too dry, the needle holes from sewing act like perforation instead of binding. For thicker hide like mink, muskrat, wolf, beaver you can test the fur. If you peel back a bit of lining on your garment to expose the hide, try and poke your finger through the hide (preferably not on a seam–though some fur is made up of nothing but seams). If it takes a lot of effort to tear, or if the hide simply doesn’t tear, your fur is probably going to do well in the sewing process. If the fur tears easily or acts like paper once there is a little hole (as long as it isn’t along a seam) then it is pretty dried out. For thin hide like rabbit and silver fox, this test won’t work because the hide will poke through even if it is in good condition. The best thing to do is send me the fur so I can assess it. There are things I can do to re-enforce most hide (in fact, I rarely have to send a garment back). If you are unsure, you can send the fur to me along with your order. If the fur simply won’t work, I’ll ship it back along with your returned payment minus the cost to ship the garment back. Is there any option for fur that is dried out? Yes, there may be. If your fur is in bad shape but you want me to try and use it, I have a process I’ve developed that has made it possible to use every fur that has been sent to me so far. However, there are no guarantees so I will only attempt it with the following understanding. If it simply won’t work after I’ve tried, I will return all but $20 of your money. It requires me to cut the fur in order to create a bear arm and leg. I use a process I’ve developed but I won’t know if the fur will split at the seam until I turn and stuff a sewn piece or two. If the test does not work and you want the fur returned, I will also charge ($15) to ship it back at that point. What happens to the extra fur? Most of the time, there isn’t much in the way of extra fur. Very few people have only wanted one bear from the fur they have sent me so I’m frantically working to get the number of bears they want from the fur. However, occasionally there is a little fur left over. Unless the person who sent it specifically requests to have it back, I will keep it and use it to augment other projects–or use when I want to do a test run on a new pattern or approach (I have a growing collection of prototype bear heads 🙂 . If I’ve collected enough extra fur to make a bear, I’ll sometimes create one, but it doesn’t happen very often. There isn’t much of a market for people who want to purchase a bear specifically made from real fur and there is a segment of the population that is offended by what I do so I can’t just make a real fur bear to give to a charity auction. The people coming to this site are looking for someone to help them turn their heirloom fur into bears so it is a more personal service rather than a manufacturing process. I have an old fur coat I don’t want, do you take donations? Yes, if you have an old fur coat you don’t want I will take it off your hands. I’m not in the market for buying fur but will happily reimburse your shipping costs. Most of the people coming to this web site want bears made from THEIR fur and very few people are simply looking for a pre-made bear made of real fur so it isn’t usually worth it for me to spend money on fur to make bears from. If you have the energy, you might be able to sell your fur through an on-line auction. Do you use the garment lining? Yes, if the garment has lining material that can be used for paw pads and ear pads as well as noses sometimes, I will use it if at all possible. I will try to use it to make a scarf for each bear as well. If the lining is just too old (old satin degrades to the point that it simply tears easily), I use satin scraps from my own supplies. If there is a special embroidery element, I try to work it into a scarf when possible. How much fabric does it take to make a bear? I have a couple of shirts from my late husband and would like bears for each of my grandchildren. How can you use them to create five bears the same? What happens to the extra fabric? Most of the time, there isn’t much in the way of extra fabric. Very few people have only wanted one bear from the garment they have sent me so I’m frantically working to get the number of bears they want from the available materials. However, occasionally there is a little left over. Unless the person who sent it specifically requests to have it back, I will discard it. How many bears can you get from a wedding dress? Most of the time, there isn’t much in the way of extra fabric. Very few people have only wanted one bear from the garment they have sent me so I’m frantically working to get the number of bears they want from the available materials. However, occasionally there is a little left over. Unless the person who sent it specifically requests to have it back, I will discard it. There may be a “return remnants” fee if the remnants are enough to impact the cost of shipping & handling.